Gaon. It is known for fishing and the bird life that exists there – and all of these are at stake due to the SEZ that falls under 10,000 hectares of this wetland ecosystem." 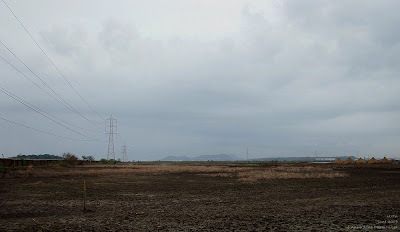 I went on a walk at Uran, a township in the Raigad district famous for its wetlands. It takes around one hour to reach this place from Mumbai. It is a hotspot for flora and fauna, especially birds. It is also a hotspot for industries, and is in the eyes of the government. The day was not so perfect for any sighting, we presumed, since it had been raining on and off for few days but I guess I underestimated my luck. 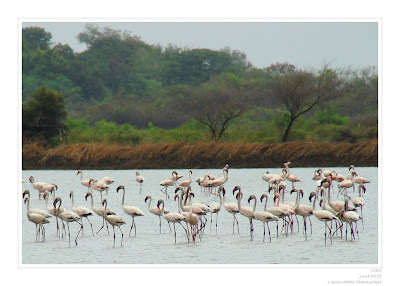 Uran is a place where, if you go during any time of the year, will see many birds. And they will make sure you see them too! It is a place with excellent birdlife and others associated with the wetlands. Uran is exclusively known for fishing, thanks to the abundant water sources, whether fresh or creek. It is also known as the infamous SEZ that is going to literally wipe out all the ecologically significant wetland habitats. I was reading a newspaper one morning, and in the readers’ feedback section, somebody had written in favor of SEZ. I am not against those who speak in the likes of SEZ, but that person also spoke of environmentalists in a harsh way, that they are always against development and are never in favor of the city (Mumbai). He was so straightforward, that I thought environmentalists are corrupt politicians, and they do what want to do. I’d like to tell him that environmentalists are not dumb to stage protests against development. I’d suggest him to step out of his concrete walls and walk in the wild. I’d advice him to open his eyes and look out him self. I’d shove the pictures of destruction done at Uran on his face. I wouldn’t get agitated now for it’s worthless. It is sad to see people ignore the wild, so much so that they get blinded by development. Raigad district has 17 SEZs and one of it is Uran – closest to Mumbai. It is said that around 10,000 hectares of land will be used for industrial development. All at the cost of villagers, their fishing spots, mangroves, reptiles, mammals and the resident as well as migratory bird life. It has been in picture for past 5 years, and NGOs are doing their best to protect these wetlands, mangroves especially seem to be paved and buried in heaps of dirt and wastes. Reliance, the “pioneer” of wetland destruction, seems to be a deaf ear and a blind eye towards this, even today. The SEZ at Uran will be using up vast agricultural and fishing grounds of the villagers, relocating them somewhere else. This has caused all the concern but aren’t we forgetting something? We saw huge garbage dumps – where once existed vast mangroves. We saw mangroves burnt and chopped, chemicals from a nearby factory running into waters, a man building a wall of mud to contain water in it so as to use it as an aqua culture (that is illegal) – thereby suffocating the mangroves and letting them rot. We saw huge debris spread over a shocking vastness, all to build factories upon it. I remember reading on reports by Adesh Shivkar, a well known Ornithologist in town, speaking his mind out about Uran, a nigh two years ago. Now it is vastness of nothingness, save a little area with scattered mangroves and inlets of industrial effluents. Mangroves are important to us and the wild. They are the lungs of our planet. They are known to absorb largest amount of CO2 – a greenhouse gas. They are known to keep the water at bay, thereby helping as a buffer against sea water from coming in – and saving the mainland from flooding. Mangroves are a haven for wildlife – aquatic, terrestrial as well as aerial. It is a shelter for young fishes, a place for birds to eat and nest and for wild animals such as Wild Boar, Jackal and a variety of reptiles to stay. All this, 10,000 acres of this, will be gone. It isn’t coming back. All we did was, wow this place is awesome, is it going to go too? Alas, this place must have had thousands of flamingoes flocking here. Some even said, oh I remember this place, it was so beautiful before! Some remembered seeing a huge python, all in the recent times. 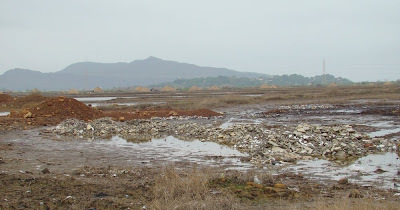 The destruction is fast proceeding, with tonnes of wastes thrown in the mangroves everyday. 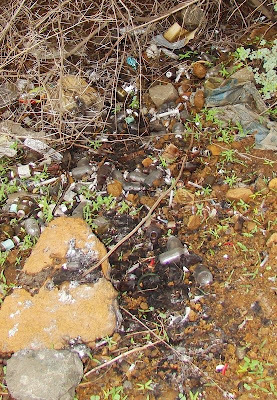 We were startled to see medical waste lying near mangroves, along the roads in heaps. Medicine bottles, syringes, injections, so many other things that should have been incinerated and vanished. But it is here, in the middle of wetlands contaminating it! We thought twice before stepping in the mud barefooted. Amidst this pitying landscape we saw flocks of flamingoes, many in numbers. Other water birds were present in lesser numbers. We also saw some mangrove associated animals, living on the brink of extinction. The overall diversity was lesser than expected and I would like to do something about it! Stop development! Stop encroaching in the mangroves! (Pokes the reader I spoke about earlier). Lastly, I hope whatever development they do, they consider the natural flora and fauna of this place and leave them some space to live and sleep. If they protect their habitat, they’ll be protected by the forces of nature. If they want business, they can save wildlife and show it to the world AND make sure to dispose their waste smartly. That’s development – Sustainable Development. Black Marsh Trotter: Tramea limbata – A dragonfly hard to miss, prefers perching high over a water body to get a better view, scanning for prey. It is known to be active throughout the day. Only one individual was seen far off in the marshes. 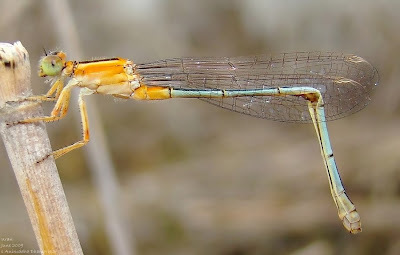 Senegal Golden Dartlet: Ischnura senegalensis, female – A female damselfly, seen with a broken abdomen. I. senegalensis has many morphs in females, this one being one of them. 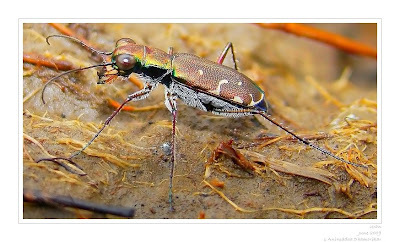 Tiger Beetle – The fastest and quickest beetle, belonging to Carabidae family of Coleoptera, is predatory in nature. Many Tiger Beetles were seen on mud lined by dried as well as green grasses. Camponotus compressus – A big ant, seen throughout Uran, several colonies were located in tree holes. 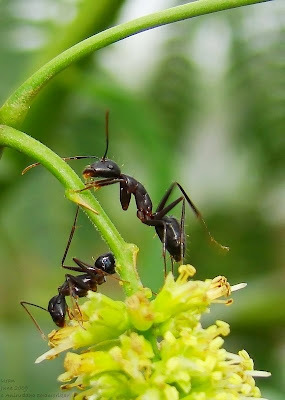 These workers were seen feeding on Prosopis sp. inflorescence. It is a specie that indicates a disturbed habitat. 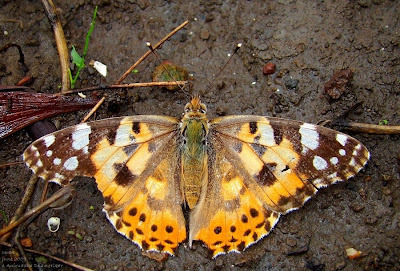 Painted Lady: Vanessa cardui – A nymphalid that has global distribution. Only one individual was seen sitting on the ground and had a weak flight. 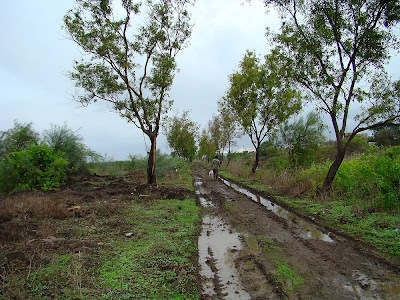 It is commonly seen pre-monsoon and monsoon. 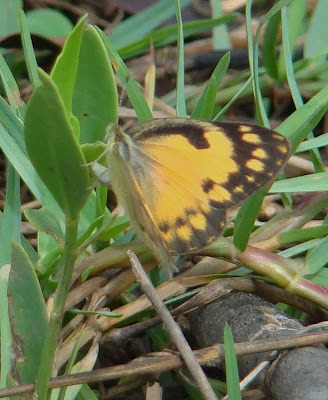 Small Salmon Arab: Colotis amata – A pieridae butterfly, associated with the mangroves. Many individuals were seen near mangrove swamps. 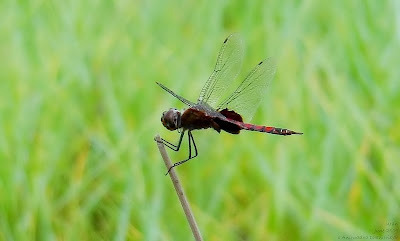 This individual was seen laying eggs on a mangrove sapling. 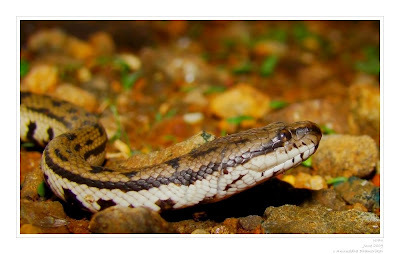 Glossy Marsh Snake: Gerarda prevostiana – A small snake, associated with wetlands is also common at Uran. It feeds almost exclusively on crabs. It is slow and lethargic on land, however swims swiftly in water. It is mildly venomous and not aggressive. 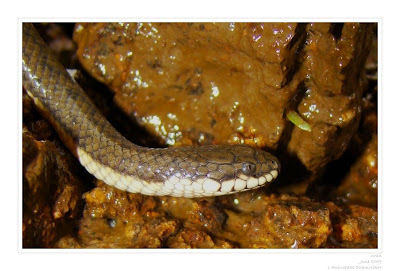 Dog-faced Water Snake: Cerberus rynchops – A snake commonly seen in wetland habitats, such as mangroves, is fairly common at Uran. It is a semi-venomous water snake, nocturnal in behavior feeding on fishes. It is a small snake and less aggressive in nature. 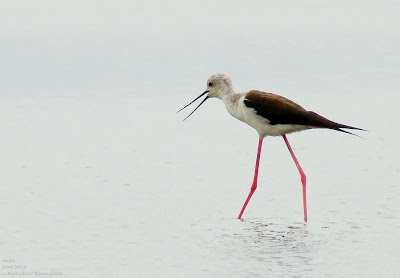 Black-winged Stilt: Himantopus himantopus – A long legged wader, common throughout the region was seen feeding in ankle-deep water. 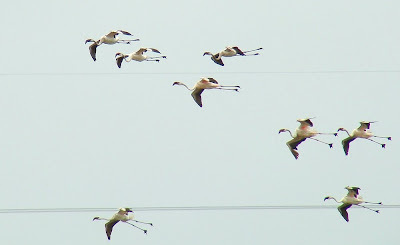 Only two individuals were seen, however they are generally seen in flocks. 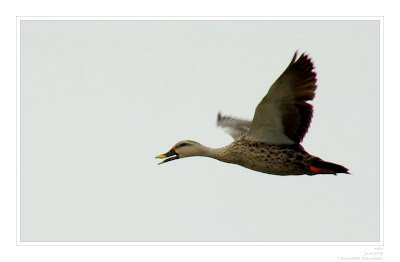 Spotbill: Anas poecilorhyncha – A beautiful duck, prefers fresh water and marshes. Good numbers of these were seen in flight. They are usually seen in flocks, babbling in the water. Lesser Flamingo: Phoenicopterus minor – It is a subspecies of flamingo; it is the smallest of all flamingoes and most abundant. It is a Near Threatened specie according to IUCN, and quite evident in India by encroachment, landfills and industrial effluent runoffs in the wetlands. The numbers at Uran were less, but were seen at an approachable distance from the bank. Lesser Flamingoes with juveniles in flight. Prosopis sp. – It comes under leguminous spiny trees and shrubs and can thrive in dry and arid regions. Many trees were seen at Uran. 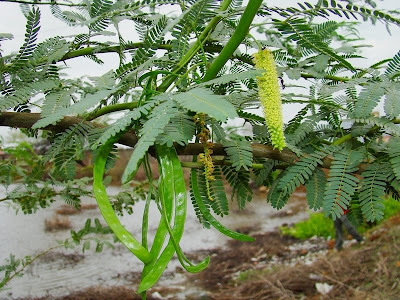 It is considered economically significant tree by farmers since it can be used as a fuel wood and as fodder for cattle. Typha sp. – It is a monocotyledonous plant, growing exclusively in wetland areas. 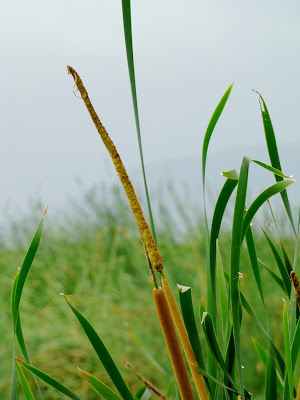 It is commonly called Rambaan (Ram’s arrow) in Marathi and Cat-tail in English. It is a tall reed and provides shelter for various fauna. Rambaan is an area good for birding. The kuchha roads here are lined by Australian Acacia. A short walk at Uran was an eye opener. With fast vanishing wetland habitats that are needed to be conserved during this age, naught can be done but develop an eco-friendly strategy to sustain this region along side the growing industries. The wetlands are the largest conservators of water other than main water sources, and landfills in these regions will only contaminate the groundwater – the effects of which will surface only years later. It is wetlands that are most biologically diverse than other ecosystems – and that makes Uran a special place. To conserve Uran, the best means would be sustainable development. 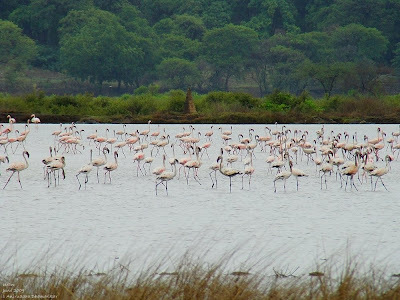 Uran has a potential of having industries working side by side with flamingoes doing their daily chores. By keeping the industrial effluents under strict control and leaving a breathing space for nature, one can work side by side with nature. A vast expanse of land lays dried under the cover of monsoon clouds. What will be the future of this area?